Guinea pigs are popular pets because they’re very timid. They love to cuddle and they come in different colors. Wild guinea pigs are found in the mountain ranges and grasslands of South America. They eat seeds, grass and other types of plants. To get away from predators, they hide in rocks or very tall grass. 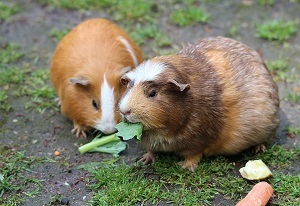 Guinea pigs were once called cavies. About 400 years ago some were taken from Europe and kept as pets. People began to call them guinea pigs but it is unclear why their name was changed. Some people think it came from their pig-like squeaking sound. These animals can live for five or more years, growing to 8 inches long. Like beavers, their front teeth can grow very long and to keep their teeth short, they need to chew on carrots or blocks of wood. Overall, guinea pigs have many interesting features, leading to 400 years of popularity.